Happy Spring! More of you are experiencing it now, sorry that some of you are still stuck where winter is holding out. 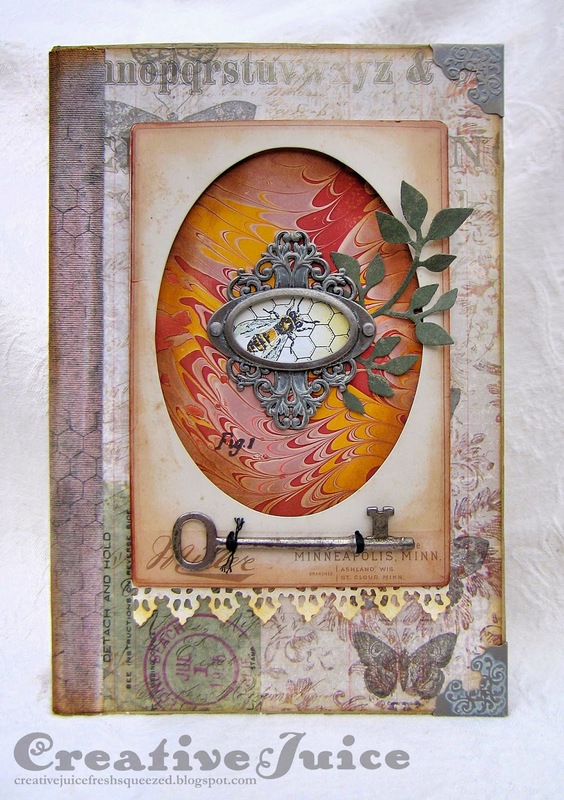 I was excited when Tim Holtz debuted the Mini Configurations Book, the configurations products are so much fun and this little book is a perfect size. I knew I wanted to do a spring-themed project, especially with the new Wallflower paper. I think this paper stash is my favorite that Tim has done to date. I covered the front and back with paper from the Wallflower stack and used Sticky-back Canvas for the spine (after coloring and spritzing with Distress Stains, and stamping with archival ink). The cover embellishment is a Cabinet Card frame with a piece of paper I marbled slid into it. I distressed the metal Ornate Plate and corners using Distress Paint (Picket Fence and Iced Spruce). Distress Paint works really well on metal. You just have to dab it on with the applicator and let it partly dry, then wipe off the extra with a rag. The paint stays in the nooks and crannies. The key is an old vintage one from my stash. 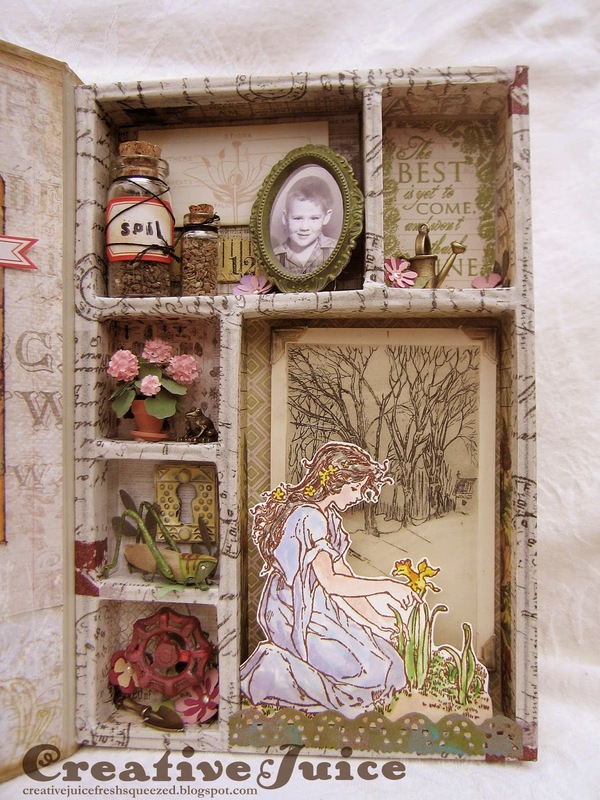 I just loved the Stampendous Daffodil Girl stamp and knew I had to use it in this project. First I stamped it with archival ink onto smooth watercolor paper. Then I "watercolored" it using Distress inks. A super easy way to do this is to swipe your Distress ink pad onto a craft sheet and then pick up the color with a wet brush (or you can use a water brush) and paint onto the image, blending colors as needed. I hope you are inspired by the colors and views of spring! 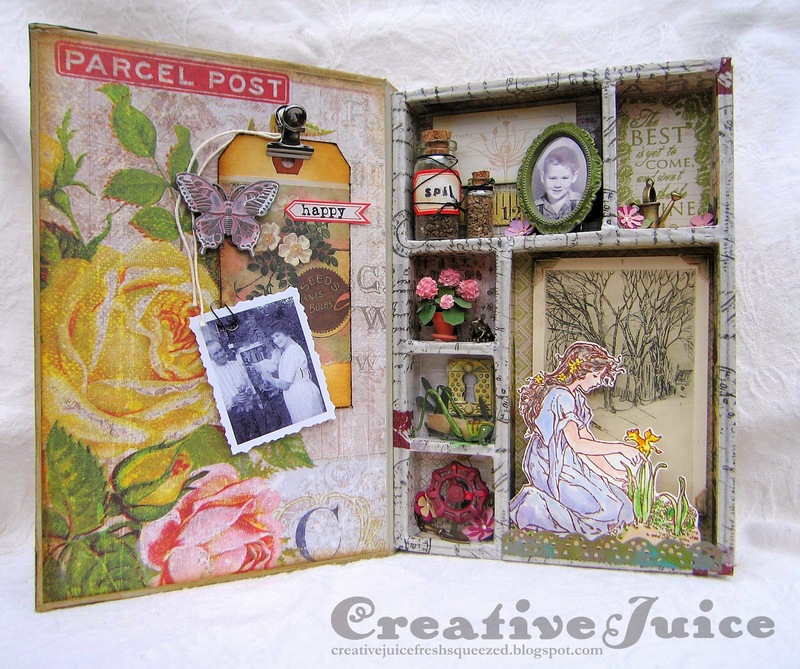 You still have a few days to enter the Splash of Color challenge at Inspiration Journal. You could have a chance to win $50 to spend at Inspiration Emporium by linking up your project there. Most of the supplies I used for this can be found at Inspiration Emporium. Follow the links below and use my code JUICE to save 10% if you go shopping. Really pretty box. Well done Lisa. I love your configuration box! The papers and the embellishments you used are perfect. Lisa I sent a comment to tell you how much I love your box. But it did'nt show up. Dont know if you have enabled the approval function. But anyway your box is FABOLOUS !!!!!! Hi Lisa,that is a totally cool configuration box. I can see Spring is in the air. Tou have made this wonderful and suh sweet items and colors. It's truly outstanding, Lisa! Love the delicacy, and every details! Very beautiful. I absolutely love that configuration book with the fabulous details. Fantastic!